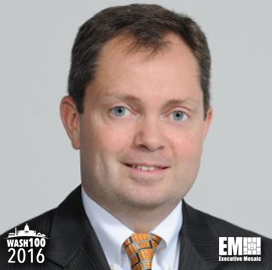 Executive Mosaic is honored to introduce Steve Rubley, CEO of Thomson Reuters Special Services, as an inductee into the 2016 edition of the Wash100 — Executive Mosaic’s annual selection of influential leaders in the government contracting arena. Rubley also serves as managing director of the government segment within parent company Thomson Reuters‘ legal division. Thomson Reuters Special Services is a subsidiary of the global financial data and research company and has sought to bring technology to update the processes and workflows in the U.S. legal system during his tenure. The subsidiary’s court management solutions business deployed the C-Track case management tool at the Superior Court of California in San Francisco and installed an e-filing system at the Supreme Court, district courts and circuit courts of Wyoming. “Thomson Reuters has been an integral part of the U.S. legal system for more than 100 years, and for even longer in the U.K.,” Rubley said. As CEO of Thomson Reuters Special Services, Rubley is also in charge of a business that provides analytical support for the federal government’s national security programs. Before he was appointed to his current roles in 2012, he served as vice president and general manager of the risk and fraud segment of the legal division. He joined the company in 2008 after its acquisition of ChoicePoint Government Services, where he worked as a vice president.